The purpose of this article, originally written in 2005 and since updated, is to help anyone who has, or is training for, an IR and who is unfamiliar with IFR flight planning procedures in Europe. Later, the information was expanded following requests from other pilots. The weather section should be well known to anyone with an IR but was requested for a magazine article. The article is written from the perspective of a UK single-engine non-pressurised pilot limited to say FL200. The writer is the holder of a UK PPL/NIGHT/IMC, FAA CPL/IR, JAA/EASA PPL/IR, with 1700 hours (2013), mostly in a Socata TB20. It's difficult to get this info together. Fresh EASA IR holders have usually trained between a very limited number of airports in the UK. The EASA IR/ATPL Theory is totally inadequate because it teaches methods which have not worked for about 20 years. Seeking the advice of a working airline pilot is productive but only up to a point because the route planning and flight plan filing is done by a separate ground team. FAA IR holders who trained in the USA have an additional hurdle to cross because the U.S. system is different and a lot simpler (one can plan an airways route from the chart alone, and usually one can fly it as filed). The U.S. airspace rules can be very different from the European ones although they are closer on IFR procedures. FAA IFR clearances are different too. The FAA IR pilot flying an N-reg aircraft must comply with FAA rules but also any local rules of the air: CAA, EASA, ICAO - the whole lot. Certain minimum equipment must be carried on the aircraft. Contrary to popular belief among pilots there is little or no regulation prescribing equipment to be used. Usage is not the same as carriage! For example, many UK private pilots believe that GPS usage is illegal, which is rubbish. The equipment that needs to be carried varies from one country to the next, and of course varies according to the class of airspace, and the full matrix would be so complicated that a pilot would tear all his hair out and never fly again. The UK Air Navigation Order (search caa.co.uk for cap393.pdf) lists the required equipment in Schedule 4 and Schedule 5. There have been some recent amendments concerning the carriage and use of oxygen, for example, but these apply only to G-reg aircraft; oxygen use in an N-reg is governed by the well known FAA rules. There have been more recent EASA regs on the use of oxygen which apply to all EASA airspace regardless of aircraft regs. GPS: The UK ANO is silent on GPS. However, BRNAV (basic area navigation) approved navigation equipment is mandatory for IFR in controlled airspace all over Europe. In the GA context the only useful way to meet this requirement is a BRNAV approved IFR GPS (one other way is a BRNAV approved KNS80 with antenna filters, but that won't be any good if out of the coverage of a VOR/DME). The common FAA/IFR-approved units such as GTN650/750, GNS430/530 and KLN90/KLN94 are OK if the GPS supplement (the AFMS) in the aircraft operating manual authorises their use for IFR navigation. Owners of N-reg aeroplanes who fly GPS approaches in the USA will likely have a suitable supplement in their operating manual but merely fitting e.g. a GNS530 will not result in an installation legal for this purpose. ADF, DME: Until about 2013, the UK Air Navigation Order required an ADF for all IFR in controlled airspace. The ADF requirement now remains only for instrument approaches that contain an NDB. A quick look at some other AIPs at the Eurocontrol EAD website suggests this is not common. The equipment list for each country is in the country's AIP GEN 1.5 though often this points to another part of the AIP. You can find the current AIPs at the main EAD site under "Pams Light". In 2013 this document came out which removes the need to carry an ADF for enroute IFR, and some other situations. There is no central repository for this stuff that I am aware of; the EAD website (requires a password but registration is free) is supposed to become such a repository. A list of national AIPs is here - many of these also appear at the EAD site, and not necessarily with identical data!! There is an interesting argument that a GPS qualifies as a "distance measuring equipment" if the requirement is thus worded. Since all these regulations specify equipment to be carried but don't specify equipment to be used, there is a further possible argument that any means of navigation (and, therefore, a GPS of any sort) can be used to fly NDB approaches especially outside controlled airspace, if the requirement for an ADF is limited to controlled airspace. It would be interesting to find out whether any of the national aviation authorities have obtained legal advice on this. If they have, and the result was what I think it was, they would not be publicising it... Despite persistent rumours, there is no evidence that ADF+DME carriage has ever been enforced. The most commonly highlighted scenario is the Cirrus SR20/22 which have been sold in significant numbers in Europe with an IFR GPS but without ADF or DME. If the aircraft is not G-registered then it must also carry any equipment mandated by its state of registry so e.g. if it is N-reg it needs to carry an ELT. PRNAV (variously called RNAV1 or PBN, in its various guises) is the big shadow on the mandatory-equipment horizon, not in terms of flying but in terms of wasting money on pointless avionics, but currently nobody knows what will happen and when. The requirements are being formulated in piecemeal fashion around the European CAAs (see JAA TGL10 for a start) and as usual they are being anally retentively interpreted by some authorities. Some notes on PRNAV are near the end of this article (under avionics upgrades). PRNAV could be a major issue if "PRNAV-mandatory" airspace came into existence but this is not currently on the horizon. It's much easier under FAA (N-reg) where a LoA (letter of authorisation) from the GPS manufacturer does the job, and the more modern GPSs come with one of these. Current rumour is that RNAV1 will come maybe in 2018 and PBN in 2020. Some notes on the applicability of FAR Part 91 outside the USA are here. Do ATC care about your equipment? It is up to the pilot to make sure he is legal for the route, airspace, etc. However, this leaves the question: do ATC look at the equipment declared in the flight plan and offer different routings? My enquiries suggest that in Europe the answer is NO. I got a very different answer for Australia though. However, the Eurocontrol computer has been reported to be rejecting any flight plan above FL195 which does not list 8.33 capability, and also rejecting ones filing at RVSM levels who do not declare RVSM. One would think that an IFR flight plan not listing BRNAV capability would get rejected, and similarly with Mode S in many airspaces. However, there is no evidence that Eurocontrol or ATC look at this at all - currently. From late 2012, IFR flight plans need to declare the PBN (performance based navigation) level. You need to put something like PBN/B2 into Box 18. See the Flight Plan RNAV Parameters document here. If this is missing, Eurocontrol will reject the flight plan. The first thing is to plan the route along the airways system. One can use the paper airway charts (Jeppesen or Aerad, etc). I think the Jepp charts are much better because the Aerad ones combine both upper and lower airways on the same chart and do it poorly. Or one can use IFR flight planning software like Jeppesen FliteStar IFR or, at a stretch, Navbox. The airways under discussion are highlighted in yellow. Airway L604 runs on a track of 331 (degrees magnetic) from YNN (108.60) to TRN (117.70), and bidirectional. The airway MEA is FL110. Airway G12 also runs between YNN and KRK, MEA is FL080, and is bidirectional. Airway M600 runs on the same route, MEA is also FL080 and is also bidirectional. The distance between these two waypoints is shown as 38nm. Airway W62 is directional from RODON to GRIBA but continues as bidirectional from (apparently) GRIBA to KRK. b) Conditional Routes (CDRs). On a lot of Jepp charts, some of the airways have a black '1', '2', or '3' after the designator. These are routes which are normally closed during the week but are open sometimes in the evenings, but more often than not during weekends / public holidays when the military aren't playing. c) Temporary restrictions. These are just that. If e.g. there is a big airshow or military activity somewhere, then an airway might be closed. Eurocontrol runs a database which contains all this and all FPs are verified against this database before acceptance. Obviously there is no way to plan a definitive route with any means that doesn't have access to the database. The Job #1 is to get an FP accepted. It doesn't have to be exact since ATC will give you a series of direct-tos (or, in busy airspace, vectors) anyway along most of the route, so the route finally flown will always differ from anything planned. IFR flight plans are filed via a Eurocontrol system called IFPS (Integrated Flight Plan Processing System) which distributes the flight plan to all enroute units, plus departure and destination, in seconds. This makes it possible to file a flight plan and depart minutes later - as soon as the tower confirms they have received it. In the following text, the words Eurocontrol, CFMU and IFPS tend to get used interchangeably, and both refer to the computer is Brussells which validates and manages the IFR routes. How to design a valid route? There are various ways to design a route which is accepted by Eurocontrol. Ideally, the route should verify with the Eurocontrol route verification website before it is used in a flight plan. This website is routinely used to verify a route before it is used in a flight plan submission, but it isn't useful for generating a route, and the majority of its rejection messages are rather cryptic. About the only obvious ones are where some airway does not exist below a certain level - in that case you simply raise the level - unfortunately that often exposes a problem elsewhere where an airway does not exist above a certain level.... The validation website is accessed via the new Eurocontrol portal here under Flight Planning, and you can choose two ways to enter the flight plan. Just pick the airways, noting their directions and MEAs. This still works in some parts of Europe (notably W. France) but is otherwise nearly useless due to all the additional restrictions. As with a) above, this works OK in some parts of Europe but today most of its routings are rejected by Eurocontrol, largely because Flitestar is an offline product which seems to work purely on the airway MEAs and permitted directions, and does not take into account the other restrictions. A lot of people have been doing this for years and think that this enables Eurocontrol to amend the route regardless. However, it occassionally does still result in a rejected flight plan, and then you are stuffed with no options left but to try some other route. My experience is that on occassions Eurocontrol will wash their hands of amending a route, and it is likely to happen at the least convenient time, because if you had time to play you would have worked out a good route to start with! This method obviously assumes that the pilot has a means of receiving the amended route, so he knows what he is supposed to be flying! With some flight plan filing services (Homebriefing was the original online one, EuroFPL is a more popular one, and today there are others) you have the option of an email and/or a GSM text message. The airport tower should advise you of any allocated departure slots, but may not know that your routing has been amended from what you originally filed. I almost never use this method because I prefer to depart on a route which I have planned and for which I have the printed data. It soon became clear that the only way to do this was a "brute force" approach: develop a route using a local copy of the airway database, submit it to Eurocontrol for validation, and then iteratively modify it until a valid route is achieved. Also it's clear that using more than one level helps - even in the absence of issues with airway MEAs or terrain - as ATC tend to ignore the filed level changes. DCTs can also be used, though ATC tend to disallow them if a DCT leg crosses a piece of the airspace of another country. They remain an essential tool for connecting a Eurocontrol route to airport(s) which don't have published SIDs or STARs. Around 2003. this horrid Italian site appeared. It seems to have the SRD and CDR database but doesn't do any validation. Usually, you have to play with it interactively, adding more and more of the restrictions that appear in the table at the bottom of the page, copying and pasting each route into Eurocontrol's validation website, and eventually you might get something that works. I used this site for 2 years after I got my IR in 2006 - there was nothing else! Two new tools appeared in 2008, both developed by private pilots: Autoplan and FlightPlanPro (FPP). These tools generate valid routings, by initially routing via a stored airway network, submitting the route for validation, and iteratively modifying it until it validates. Autoplan was abandoned by its author due to a string of changes done by Eurocontrol to frustrate the use of these routing tools. FPP continues (3/2014) as a free tool; however as its code is also used in the commercial RocketRoute service, there is a concern that it will not be free for ever. In 2009, Eurocontrol opened a "business-access" facility which has a "route suggestion" feature; this does generate 100% valid routes but - mostly due to the whole route being at just one flight level, and not using any DCTs - the routes are often considerably longer than the above tool(s) and some of the routes are plain silly. Some details of this facility are in this trip writeup. This facility is currently accessible via the FPP tool, and via the EuroFPL and RocketRoute flight plan filing services. 3/2018: FPP no longer works. In 2014 the Autorouter appeared. It has many features including preflight briefings and works well on a phone. There is also a product from a German company which combines in-flight radar etc data using a satellite downlink; the price however is very high. There are two contact numbers for Eurocontrol where somebody can help sort out problematic routings. The numbers for the IFP1 and IFP2 help desks are: +32 2 745 1950 and +33 16 988 1750. If your flight plan is getting rejected, or you would like to avoid certain routings (e.g. long over-water crossings, where there is an obvious alternative) just call them up, give them your callsign/reg and tell them what the problem is. They are reportedly very helpful. They also have the ability to force an unacceptable flight plan through the system manually, for exceptional occassions. These are applicable whichever way you generated the route. Avoid filing a route which is too low. Below FL100, the routing options start to get much less attractive and tend to vanish below FL070. Filing for FL140+ yields much better routes. Obviously you must be able to actually fly at the filed level(s) and this implies oxygen or pressurisation, but if it's a nice day one can ask for a "stop climb" at say FL100 and much of Europe can be overflown at that level. The UK adds an extra dimension to this: you can have a flight plan validated by Eurocontrol which is then rejected by the UK's IFR controlling authority - generally London Control in the southern parts. The rules for this extra level of checking are UK-confidential and are not supplied to Eurocontrol. So, in the UK, you need to make sure that your route is high enough to lie in controlled airspace and again FL100 is a good starting point for longer flights. Trivial flights and IR training flights (e.g. Shoreham EGKA to Lydd EGMD) can often be filed at lower levels e.g. FL070. Above FL200, the Upper Airway network opens up many much more direct routes. Avoid named waypoints. This is a last-resort hack. The Eurocontrol software does not error-check a route whose waypoints are specified using lat/long coordinates, or using the standard VOR-relative notation (e.g. MID240033 being the 240 radial from MID, 33D). Such waypoints merely need to be less than 50nm apart (or whatever the maximum permitted DCT leg is within the airspace in question). In some cases one can use the absurd reduction of this e.g. MID000000 DCT CPT000000 to avoid the computer thinking you are routing along an airway running MID-CPT and enforcing the airway MEA/direction. Flying to/from airports with no SID/STAR. Often, when departing from or returning to the UK, the first or last part of the route lies outside controlled airspace (OCAS) and such airports do not usually have SIDs or STARs. 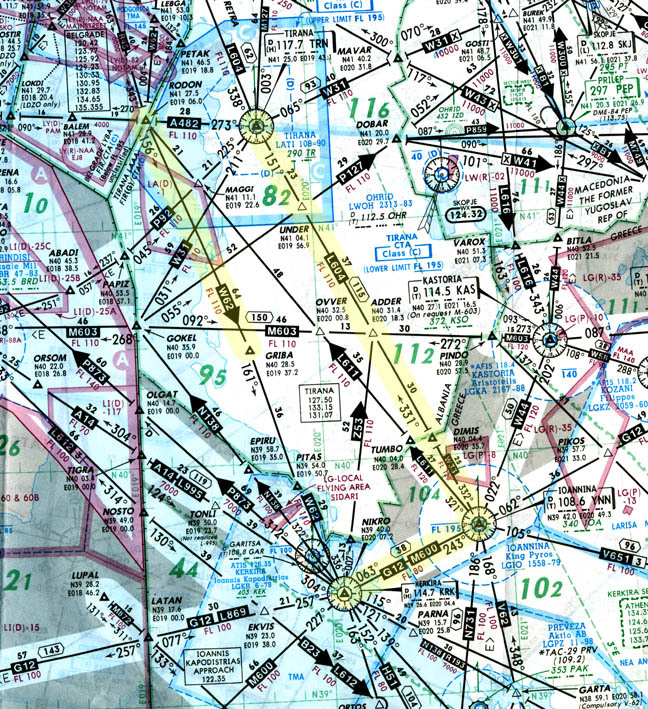 The most official way to handle OCAS sections is to file them VFR (using a Y or Z flight plan) but this is largely unnecessary - a straight DCT from the airport to the terminating waypoint of the airways route usually works nowadays. VFR-only airports For some countries (notably Spain and Germany) CFMU rejects "I" flight plans to/from an airport without IFR procedures, so you have to use Y or Z. Slots are rare on some routes and common on others. They are little more than a CFMU software artefact and are often cancelled (or substantially reduced in their delay) within the hour before departure. This means you have to be sitting in the aircraft and ready to go at the original EOBT. I have seen 2hr delays reduced to 10 minutes; the process is so haphazard that the only meaningful strategy is to remain ready to go as filed, and accept whatever delay you get. I've had a slot on about 20% of my IFR flights; in one case it delayed the flight by an hour and forced a hurried re-route because the originally planned airport would have been closed. Then, the slot disappeared so I could have departed at the original time and on the original plan! As mentioned above, the UK does things a bit differently from the rest of Europe. There is a largely water-tight division between the IFR/airways controlling units, and everything flying below that. The airways traffic gets a proper service, while everything below gets something ranging from nothing at all to some kind of part-time radar or flight-information service. a) The flight plan will be discarded by London Control and will be effectively treated by ATC as a VFR one, will thus get sent to departure and destination only, you get no enroute clearance at all, and nobody enroute will know anything about you. b) The flight plan is accepted by London Control. You get airborne, and on contacting the first IFR unit they will assume you have the full IR etc and will send you up into the Class A airspace. This is OK if you have an IR and have planned for this, but some pilots who have just the IMC Rating (no IFR privileges in Class A) have inadvertently managed to file such a flight plan and have ended up tearing their hair out when they get directed into Class A airspace. London Control (or whichever authority is handling you in the relevant part of the UK) does not have procedures for routing such pilots around in Class G and Class D, avoiding Class A. So, if flying low level OCAS IFR around the UK, the best way is to either not file a flight plan at all, or file a VFR one and then change to IFR when airborne (which is just a pilot decision; no ATC clearance is needed in Class G). The chance of getting a "popup IFR clearance" i.e. a clearance to enter Class A for an enroute flight, is very small, so if there is any chance of you wanting to do a high altitude IFR flight (which in most of the UK implies Class A airspace) then you better file it at the proper high level to start with. So, proper Eurocontrol IFR in the UK needs to be filed rather high and FL100 is a good starting point. It is common to get a very early descent prior to arrival. ATC may be trying to do the pilot a favour by dropping him out of CAS, or they are just trying to wash their hands of traffic which gets in the way. This may be fine if you have 30nm to run in a straight line, but is not OK if they drop you out of CAS in the middle of the London TMA and you have to work your way around, remaining below the 2500ft Class A base, in between many airfield CTAs, back home. This is a persistent complaint from UK private pilots. The pilot is in fact entitled to request to remain in CAS and to be given an appropriate route back home, but he has to descend sometime! The situation is gradually improving. A silent loss of the IFR clearance. Often, when flying from France to the UK at levels below FL100, one gets transferred to London Information (a purely VFR FIS unit, with no official radar) instead of London Control (the IFR radar controlling authority for southern UK). Your IFR clearance has been discarded but you will not be told... you will discover it allright when you continue the flight, towards some controlled airspace...... London Information has to renegotiate a new IFR clearance which could take some time, and they may be unable to do it due to workload. Unless heading for one of the coastal airports (e.g. Shoreham or Lydd) in which case you will be descending anyway pretty soon, always refuse a transfer to London Information on the grounds that you are on an IFR clearance and a Eurocontrol flight plan. I think this problem occurs because France is generally Class E below FL120 which is handled by various units (including their very good radar-equipped FIS services) and above that it is done by Paris Control, and only Paris Control has a co-operation agreement with London Control... This issue, which till recently used to occur below FL120, can catch out a foreign pilot, who is flying on an IFR flight plan, who will be expecting his IFR clearance to be maintained, and who won't know that London Information cannot continue his IFR clearance. I don't intend to cover this subject here, but will list just a few tips I've picked up. This applies only to aircraft over 2000kg MTOW, flying under IFR. The billing is often called "Eurocontrol charge" but actually Eurocontrol merely collect the money on behalf of the national airspace owners. If the flight plan is partially IFR (i.e. Z or Y) then the entire route is charged for, not just the IFR portion. Once a chargeable flightplan passes through a Eurocontrol address, an invoice is generated. For IFR flights that take place outside the airways system and/or without having filed an ICAO flightplan (this is something particular to the UK; not permitted or commonly done elsewhere) the process of billing is more haphazard. Many (but not all) UK airfields report their movement logs to the CAA who in turn report them to Eurocontrol for billing purposes. Included in an airfield's movement log is whether or not each departure was IFR or VFR. The accuracy of this log, combined with the reliability of the reporting of the log through the CAA to Eurocontrol has been described as very patchy with some airfields being worse offenders for mislogged flights than others. c) The flight plan is addressed only to departure, destination and possibly some regional FIS units, and doesn't get looked at unless the aircraft vanishes. On the last one, an IR (or IMC Rated if in the UK) pilot arriving VFR can then ask for an instrument approach, with the IFR clearance which that implies. Pilots have also reported that asking for such an IFR clearance, following a VFR flight plan, doesn't appear to trigger the en-route billing in many cases. This ad-hoc change from VFR to IFR is also called a "pop-up clearance" and some countries don't like it very much. In the UK, a pop-up clearance into Class A is almost impossible to get. The enroute billing comes to a lot of money and this is one big attraction of the 1950kg PA46 Jetprop, or the 1999kg STC for the Seneca, or the sub-2000kg Twin Comanche. This is obviously crucial - as well as being a legal requirement for most IFR flights. One approach is to plan two Alternates: a "weather alternate" and a "crash alternate". The latter is in case of the destination being closed due to a crash, and can be a nearby airport. The former needs to be far enough away to not be affected by widespread bad weather. In much of Europe, the choice of the Alternate is limited by availability of Avgas, Customs and even PPR. Obviously in an emergency these don't matter but one would hope to not have to declare a Mayday for a straightforward weather diversion, and landing somewhere with no fuel might leave one stranded until an Avgas shipment in drums is organised. The route to the Alternate cannot be feasibly validated via Eurocontrol because one cannot be sure where the diversion will commence, and is normally assumed to be flown as a DCT. It is very important to keep decisionmaking in the cockpit, but if the nature of one's fuel state is made clear, ATC should be very co-operative. On long flights, it is worth asking ATC for the weather at the destination so a diversion can be done early on. In modern aircraft one can get weather over a satellite link - some notes are here. The way the ICAO flight plan form is filled in and the physical input method are as per VFR flight plans, but there the similarity ends. Whereas VFR FPs get sent using manual addressing to a) the departure; b) the destination and usually c) some area FIS service, an IFR FP goes to Eurocontrol only and then Eurocontrol distribute it to the IFR controlling units along the route. As with VFR flight plans, one can file the FP using dedicated terminals provided for this purpose at many airports. In recent years, some countries have set up websites which allow electronic flight plan filing. More information is here. Today, most pilots file using internet services such as EuroFPL or Rocketroute. For VFR this is absolutely essential because one can fly around without ATC control, or indeed without using the radio at all, and one can stumble into stuff like temporary restricted areas (TRAs). With IFR it's different. The UK is unique in that it allows IFR outside CAS, even without radio contact, and when doing that it is obviously as important to get Notams as for VFR. Elsewhere in Europe, and in UK airways, IFR is usually under radar control (exceptions being at the start and end of a flight which sometimes are done without a radar service) and ATC should not vector you into a prohibited area. So, while airport Notams are still highly desirable (e.g. to discover that an ILS is not available) the en-route stuff becomes much less relevant and most IFR pilots don't bother with it. The filed route is rarely flown exactly anyway. One can get Notams from many places but the standard UK source is National Air Traffic Services (NATS) site which offers a "narrow route briefing" where the route is entered in the standard FP format. This is just a quick bit on weather related planning for IFR. 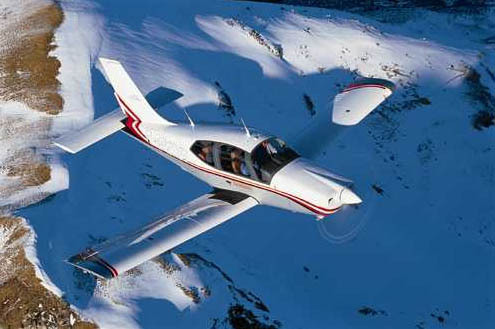 For a pilot legally limited to VFR, weather can be horribly limiting. In the UK, the IMC Rating (privileges, in short, are those of an IR but UK only and below Class A) opens up the options substantially, but they don't teach the pilot a lot of tricks on weather planning. The JAA IR (which I have done) contains a vast amount of theory on how weather works but most of it is of no use in practice. However, no interpretive skills are going to be of any use if one cannot get the data; I think that what is really needed is a selection of good accessible (nowadays this means the internet) weather data sources from which one can rapidly build up a picture. There is an often quoted phrase "official weather data". UK ANO (2005 version) Article 52(a) merely states "the latest information available as to the route and aerodrome to be used, the weather reports and forecasts available". It's reasonable to assume that a TAF, where available for the destination, meets this requirement but I have not found any regulation which lays down what is or isn't "official" and other weather data should meet the requirement too if reasonably current. This is true for both G-reg and N-reg operation. Perhaps the most obvious place for UK weather data is the UK Met Office (UKMO). Personally I prefer Avbrief as they provide a better compilation of data for Europe. This free facility run by Avbrief is perfect for people on GSM/GPRS/3G who want just TAFs/METARs while transferring only the absolute minimum of data. There is no doubt that the best short-term weather data comes in TAFs and METARs. TAFs are produced by full-time professionals. METARs are accurate, being observations. The Met Office Low Level forms 214 and 215 are also good - even if 215 does tend to show a variety of weather and one can take one's pick! The European versions from Avbrief are 414/415. The SigWX charts perform a similar function to 215, for Europe, with the information very usefully limited to FL100-FL450, but there is a vital difference: the SigWx does not forecast vertical cloud extent; the vertical extents of the scalloped areas apply to the icing or turbulence only. One problem for any pilot wishing to go away for a few days or more is that no "official" data is available more than about 24 hours ahead. There are only the MSLP charts (5 days ahead) which show the pressure and fronts and require skilled interpretation and guesswork for anything beyond the obvious like "here's a warm front; that's low cloud, high tops, drizzle and it will clear slowly". For large airports one can get long TAFs which are usually OK for a decision whether one might fly the following day. However, for locations for which no nearby long TAF exists, or for further ahead one has to go elsewhere, and the most common data is GFS (Global Forecasting System). GFS is a global weather model run by the USA. The UK Met Office has an IR satellite image here. This is great for checking for high cloud tops on the morning of the flight. In any GA aircraft, the name of the game has to be to get VMC on top as soon as possible, for reasons of icing, turbulence or simply to get some warmth! Unfortunately, there is little good data available on where the tops are. They are fundamentally hard to forecast. Often, it will be visually obvious from looking up from the ground through a scattered cloud that it is only 1000-3000ft thick and one can safely climb up through that, especially with a de-iced propeller. Otherwise, one often faces a situation something like this: a uniformly dark sky, MSA=2000ft, base=2000ft, 0C level=4000ft, tops=?? and if the tops are at 5000ft that is OK (only 1000ft of freezing IMC to climb through) but if the tops are at 10000ft then you have 6000ft of freezing IMC to climb through! Cloud tops forecasting remains unreliable and you will be lucky to get cloud tops accurate to within a few thousand feet. An article dealing with tops specifically is here and another more recent one is here. As described in those articles, since about 2009 I have been using a simpler method which uses IR satellite images together with MSLP charts and surface weather data (tafs/metars) exclusively. My tactic (flying an aircraft with a TKS de-iced prop but no other anti-ice equipment) is to scrap any flight where the forecast or actual 0C level lies below the en-route MSA - unless there is clear information on cloud tops which enables the flight to be done VMC on top. This procedure does prevent many flights in the winter where the cloud layer is several thousand feet thick and the bases are below the MSA - that is just the price one pays for not having a turbocharged aircraft with all-over de-icing. This takes one back to the question of how to find out the thickness of the layer - see "Cloud Tops" above. A huge amount has been written on the practical aspects of icing. Here is an online NASA course on it. Some useful snippets: Icing is unlikely in stratified cloud below -15C i.e. about 7000ft above the 0C level. In cumulus cloud it can happen down to -25C or even lower. The areas where icing takes place are relatively small in vertical extent so a 2000ft climb or descent is likely to stop further accumulation even if the OAT remains below 0C. If you are in rain and the OAT is showing +1C then watch the OAT carefully; the most likely exit will be a descent as the ice buildup from freezing rain will be rapid and there better not be any terrain down there... Freezing rain: there is an alternative argument for freezing rain: it must be coming down from a warmer layer above, so climbing should help. A NASA article on freezing rain is here (local copy) and from the data in there (freezing rain layers can be up to 12000ft thick) it's clear that the best thing is a rapid 180 degree turn and get out of there. Another freezing rain article is here and this confirms the aforementioned NASA information: freezing rain is not to be played with and one has to get out fast. Speed helps: due to aerodynamic airframe heating: (the following is at 5000ft and 0C, approx mach heating figures) 0.5C at 100kt IAS, 3.3C at 150kt IAS, 6C at 200kt IAS, and it's pretty obvious that a jet doing 300kt IAS will almost never ice up because its airframe will be 14C above the static air temperature (SAT). The extent to which piston GA can benefit from this is very limited, due to the low speeds, and the need to fly below Va in IMC/turbulence. I religiously use the TKS prop de-ice whenever in IMC below +1C. In stratus cloud, the worst temperature for supercooled water droplets is about -6C. I've often picked up a few mm of rime ice and my view is that rime ice is nothing to be afraid of provided one has escape options; usually a descent below the 0C level once it gets beyond several millimetres in thickness. Some aerofoils do not like ice at all, however. The other problem with flight in IMC is convection. Flying into a CB is dangerous but - without radar - cannot be avoided if it is embedded in other cloud. I scrap any flight where CBs are forecast (or, any front) where one is likely to be in IMC at the time. An exception to the foregoing would be where the CB bases are forecast to be at least 2500ft AGL and there is no significant terrain; however we are then looking at a low level VFR flight anyway. The strategy of scrapping a flight where one might be passing through a front in IMC is a simple and safe one. I have a WX500 stormscope but no radar. I've seen turbulence strong enough (CU/TCU most likely) to bang my head on the ceiling and throw off the headset, with nothing at all showing on the stormscope, which would show only electrical activity. On the other hand, I have seen (in VMC, from a distance) the sort of stuff that does show up strongly on the stormscope and one definitely doesn't want to go anywhere near any such group! I think a stormscope is highly desirable, and not expensive. If turbulence is encountered or is expected, one must slow down below Va. Often, this means flying the entire distance at below Va - also true at night even if in VMC because if the night is dark enough you never know what you will wonder into. It is also best to avoid prolonged flight in IMC with passengers as most people really dislike turbulence especially with no visual references. Sometimes this cannot be helped though, and I have found that this can be a huge source of stress. It's stressful when planning the flight to know the passengers are going to get scared and probably won't fly again, and it's much more stressful during flight when somebody gets scared but nothing whatsoever can be done about it. Flying an ILS through the bottom part of a TCU is hard enough without the passengers panicking. While the pilot must fly the aircraft regardless (and switch the intercom to "pilot only" if necessary) I am certain that many fatal accidents have been caused by this, quite pointlessly. So the objective is to get high enough to be VMC en-route if at all possible and, if not, avoid carrying passengers that are even very slightly nervous. Another problem, really big in the UK where few airfields have an instrument approach, is what to do about getting back down through IMC. In the UK there is no prohibition on flying below the MSA, IFR, if for the purpose of takeoff or landing. In other countries, e.g. the USA, this can be illegal - FAR 91.175 makes this illegal in the USA but may or may not be applicable outside the USA... So, how low should one go? I suspect a lot of people could tell some scary stories here. I would go down to 1000ft AGL in OVC conditions, having done a position fix using two independent methods of which one is GPS. Accurate navigation is essential in IMC anyway; the whole concept of MSA goes out of the window without it. I have gone down to 700ft AGL in SCT/BKN conditions and that is really my limit. It's much safer to fly down somebody's ILS and then proceed VMC to the destination - if one can get it. Or a "radar letdown" from a military radar unit. This issue causes many intra-UK IFR flights to be scrapped during planning. This can be obtained in two ways: weather radar, and lightning discharge detection technology called "sferics". Weather radar data is normally sold to commercial organisations and is thus closely controlled, but free websites showing radar images of large chunks of Europe are increasingly appearing. Sferics is much easier and there is a large network of home-based detectors, many connected via the internet and correlating the data. On my links page there is a Weather Radar/Sferics link which is a good starting point and this is the best general sferics site for all of Europe. The latest development on the radar scene is Meteox. Unfortunately Meteox doesn't cover all of Europe and has large gaps in its coverage which are not in any way obvious (e.g. Northern Italy). A great European radar site is here. When I started JAA PPL training in 2000, the instructor pinned a local FIR Notam printout on the notice board, and that was the full extent of Notam "training" within the PPL. It's useless for going anywhere. The UK Met Office Forms 214/215 were pinned next to the Notams and that was the full extent of "getting weather"; only marginally less useless than the Notams. Flight plans would be filed using a dedicated terminal (a PC hacked so it could not be used for anything else) at the tower, and if you typed in something stupid, a red phone next to the PC would ring and ask you to clarify. All that has changed - at least for people who don't want to waste a lot of their time. It is still normal for bizjet handling agents to provide a briefing pack, but the Holy Grail in light GA is to avoid a handling agent (especially a bizjet handling agent) at all costs. So, at most airports, there are no facilities for anything. You pay for the landing and parking and you go straight out. All briefings and flight plan filing must be done back home or at the hotel where you stayed. Especially as the best time to fly, weather-wise, tends to be early in the morning. So mobile internet access is essential and can be easily achieved with any laptop computer or a tablet (e.g. an Ipad). Most modern phones can also be used for browsing weather websites, usually adequately. Some notes on mobile data options are here and here. (a) Getting an IFR flight plan accepted by the system. It should be filed 3 hours before the flight planned departure time. This isn't a hard rule and you can file just minutes before starting up - basically as soon as the departure tower confirms they have the flight plan, which is usually a minute or two after it was accepted by Eurocontrol. However, Eurocontrol slots (CTOTs) are allocated 2 hours before the planned departure time so if you file later than that you may get a slot, whereas an earlier filing might not have. The degree to which this matters in practice depends on the route; routes into France and Spain rarely get them but routes into Belgium for example often do. (b) Getting an IFR departure clearance (DC) while still on the ground. This will give the current SID in use, so you need to have all the possible (or likely, given the departure runway/direction) SIDs to hand and have studied them beforehand. If departing from a field in Class G, the DC will be a provisional one with a squawk, an instruction to remain OCAS, and a contact frequency for the IFR sector controller (e.g. London Control) and you need a good VFR chart because you have to remain OCAS. (c) Departing on the SID. Often, one is asked to contact a radar unit early on which takes over control and once a heading is assigned the SID is no longer relevant (and ATC should then assign a new altitude or level). However, if an altitude or level only is given then you must still fly the SID laterally because the SID is the lateral clearance. On a SID/STAR, the lateral and vertical clearances are totally separate. At this point you are under radar control and in Europe will generally remain so for the entire route. This conversion from the assigned SID to radar control, well before the SID is exhausted, is very common. One should query any SID given whose end point does not connect to one's filed route; the reason is obvious but a more subtle reason concerns the lost comms situation: how are you going to revert to your filed route if the SID takes you off in a totally wrong direction? Sometimes, incorrect SIDs do get assigned by busy ATC. Sometimes, for example at small airports peripheral to a large city, you will get allocated a SID belonging to another peripheral airport; for example Pontoise (Paris) uses SIDs from Le Bourget... this is a nasty one because you may not have the terminal charts for all the neighbouring airports! Such a system should be mentioned in the airport's AIP, but is not mentioned in Jeppesen terminal charts presumably because they assume you will have a subscription for the whole area! If departing from an airfield which doesn't have a SID (usually, one in Class G) one departs as per the tower instructions. If the airfield does not have any instrument departure, technically you should file a Z (VFR to IFR) flight plan. However, it's better to file a fully-IFR FP ("I") because that gets you into the airways system faster, even though the initial part may be under VFR. Same if flying into such an airfield; the arrival is under VFR but one doesn't bother with that in the flight plan; just "cancel IFR" some 20 miles out and ATC will get rid of you there and then. In the UK, one has the bizzare and wonderful option of departing from any old grass strip in Class G and once airborne calling oneself "IFR". However, some countries do not allow "I" to/from a non IFR airport. (d) Fly the route. ATC will give you "DCT" or "own navigation" clearances most of the way, with vectors in busy areas, so one rarely flies the filed route exactly. It's not unusual to do a 200nm route section with vectors the whole way. More usually, the route is flown as filed but with many shortcuts. The general strategy in IFR flight is to climb to VMC on top and stay there. The filed route will have been filed at some level which passes the Eurocontrol validation, but you are not bound to this as a lower limit; two exceptions: cannot fly below an airway MEA unless authorised by ATC (and they will want to be sure you are in VMC); cannot generally fly below the base of controlled airspace (again, ATC can allow this at times). There is normally no upper limit on IFR flight; one can file a flight plan for FL100 and request a climb to FL180 "due weather" as required. A common tactic is to file a flight plan for the lowest level acceptable to Eurocontrol for the desired (efficient) route, or the forecast tops plus a few thousand feet, and then ask for a "stop climb" once in VMC. (e) Arriving on a STAR. ATC will give you the current STAR, often not long before the first waypoint of the STAR is reached. So you need to have all the possible STARs to hand at this point and have studied them beforehand. As with a SID, the STAR to expect is one that connects to the filed route. Often, the STAR is not flown (or only its initial part is flown) because one gets radar vectors to the ILS, to the localiser or to a VOR approach, and often one can ask for radar vectors instead of flying the STAR (it's a whole lot less work). If the destination is outside CAS then they will drop you out of CAS at some point and you may be offered the option of proceeding VFR. In the UK you can remain IFR at this point, under own navigation and (if you can get it) with a radar service from somewhere. Cancelling IFR: Beware of reverting to VFR in unfamiliar territory - no matter how good the weather is - because it throws you back in the bad old world of VRPs and other stuff which needs VFR charts, VFR airfield data, etc. The instant you are VFR, the whole IFR world with its predictable structures and procedures has washed its hands of you. However, as per the "VFR-only airports" note earlier in this article, some countries give you no choice (CFMU rejects an "I" flight plan when using an airport with no instrument procedures) so in those cases you do need to carry at least the VFR charts for the airport and its surrounding area. VFR data will also be needed for any transit of uncontrolled airspace; this is common around departure/arrival in many places especially the UK. IFR or VFR? There is occassional confusion among pilots, including some professional (airline) ones who don't know the subtle differences. If you arrive IFR and request a "visual approach" that is still technically IFR, but if you arrive IFR and ask for a "VFR approach" ATC could interpret that as you having cancelled IFR some way back. This is quite likely to happen in the UK where there is the watertight wall between "airways" traffic (for the most part in Class A), and everything else underneath that where the rules are more fluid especially at Class G airports with instrument procedures. If you fly an ILS and ATC think you are VFR, they will not give you the same separation from other traffic as they would if they thought you were IFR. Outside the UK, this confusion (within ATC) would be rare but in the UK it is normal to arrive IFR, from a Eurocontrol airways flight, and be treated as a VFR inbound on your first call to the destination airport. So, if you want the IFR treatment, let ATC know in no uncertain terms that you are "IFR". Oxygen is highly desirable; I find that it keeps me more awake at FL100 and makes a big difference at FL120. The TB20 has been to FL200 and up there it is obviously essential. A lot of people get headaches or blurred vision at FL120, without necessarily realising the cause. Even at FL080, where most pilots would claim (probably optimistically) to be completely unaffected, oxygen keeps one's mind sharp, and the required flow rate is very low. At FL120 one is likely to spend a lot less time sitting in cloud than at FL080, especially in the summer when the tops are higher. Even in the summer, the icing level is unlikely to be above FL100 (in Northern Europe) so the extra height capability is very handy. Moreover, the ability to file a flight plan at say FL140/160 can dramatically increase one's routing options - even if the actual flight is done at say FL120. In stratus cloud, icing happens less often than one would expect from purely being in IMC at below 0C but if you do it for say an hour, icing is a virtual certainty and one has to do something about it within minutes of it starting the appear. I have a de-iced (TKS) propeller so prop icing is a non-issue (as is windshield icing, due to the amount of TKS fluid ending up all over it) but about 5mm of rime ice on the wings is enough for me and it shows up as a ~ 5kt loss of speed! So this is another flight planning issue - how much oxygen is required for the flight. Very few European airports can refill portable cylinders; if oxygen is available the threaded fittings tend to be for pressurised aircraft (where oxygen is used only in emergency) so filling up is a huge hassle and like anything in aviation where they can smell money it can be very expensive (I once paid £150). Eventually I got sick of the hassle and now I rent the biggest available welding oxygen cylinder from a local British Oxygen gas dealer; it costs peanuts at £100/year rent and £25 for a swap/refill. More info on portable oxygen kits here. Oxygen is almost essential for European IFR flight; without it you throw away about half of your operating ceiling, and throw away the most favoured weather avoidance option (climb to VMC). For a mostly-VFR pilot, there is a new "language" to learn. When learning to fly, one can hear it but one cannot understand much of it. Eventually, as with any other spoken language, one knows what to expect from the context and that is how language works. I very often fly with non-flying passengers and in almost every case of me not understanding something, they didn't catch it either. Non-UK controllers occassionally speak poor English, or (especially further south in Europe) use dubious / ambiguous phraseology, which makes things worse. Most VFR pilots do few hours and many are struggling with decrepit aircraft fitted with decrepit equipment and radios. So, any pilot with a few hundred recent hours will find that his own radio procedure is better than most of what he hears from others on the air. However, with Eurocontrol IFR flying, you are back to the start! There is a new chunk of context to learn, and you have to be quick, because every other pilot on the radio says the same things several times a day, all their working life. ATC gives you 3-5 seconds to begin to read back an instruction and if you don't they will call you again. On the other hand, there is a lot less variation in what ATC might ask you to do, and communications are better because a lot fewer people fly IFR in aircraft with decrepit radios. When changing to a new frequency you officially have two minutes before calling the new unit and it's best to get everything sorted out and, as with any flying situation, know what to say before making the radio call. The information that needs to be passed on the initial call is only the callsign and the level, or the heading (to nearest 5 degrees). In UK IFR flight outside CAS but under a radar service, on a handover to a new radar unit, one passes the callsign and the other information depends on the method of handover. My estimate is a few hours of flying to get up to speed on the language and what to expect most of the time - not hard at all. European IFR flying is really easy 99% of the time - usually much less stressful than VFR where one is hoping for transit clearances through CAS which are sometimes not given and a last-moment re-route is necessary. Not to mention having to keep officially clear of cloud... The other 1% of the time, IFR brings a high workload, e.g. trying to find some waypoint - especially if they have given the name of the place rather than the ID of the navaid. It's a good idea to immediately ask them to spell anything that isn't clear. The spelling uses the aviation alphabet: ALPHA, BRAVO... ZULU. I have written up some IFR trips which contain detailed flight planning examples here. An excellent in-depth reference manual on European RNAV procedures is here. The big remaining gotcha in GA is PPR - an airport that requires a prior permission to be sorted out. This is a disease which is spreading through Europe. Many airports are "Customs PNR/PPR" and some will definitely refuse a landing clearance if this has not been complied with. The available ways of contacting the airports are often unsatisfactory, due to the often poor quality of airport directories and similar data in flight planning programs. This stuff therefore needs to be taken care of early. Means of contacting an airport are: a phone call (often it is necessary to speak their local language; even at international airports only ATC is obliged to speak English); an email, a fax, or the AFTN using the AFPEx AFTN terminal (available only to UK residents, and rarely works for this purpose). Within a given airport, the handling agent(s) is much more likely to maintain a working fax/email than the airport administration office. The ACUKWIK airport directory or this free directory are good starting points for contact details, though a copy of Navbox also works well. The details in the Jeppview Text Pages tend to be out of date. I have some notes on these "operational" procedures here. An article on miscellaneous tips and tricks is here.